Our clients are not just our #1 priority, they are the reason we’re able to do what we love everyday, so there’s a great sense of gratitude that we have for them. 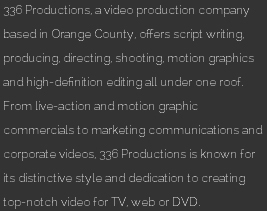 In order to build strong, long-lasting relationships with our clients, we understand that we must provide them with exceptional service and videos. We do this by being responsive, organized, focused, and dedicated. We’ve worked with start-ups that had two employees operating out of their home and Fortune 500 companies with thousands of employees all around the globe. We have worked with companies in the following industries: Insurance, Advertising, Education, Aerospace, Logistics, Apparel, Consulting, Real Estate, Textile, Communications, Financial, Medical, Health, Sports, Entertainment, Auto, Biotechnology, and Business Services.